It looks like we're coming to the end of the Major Arcana. The next three cards reflect the Fool's new perspectives. From what's come before we have the tearing down and rebuilding with the Tower, and the illumination and enlightenment of the Star. Now, what happens when we lose sight of that Star? The next card up is the Moon. 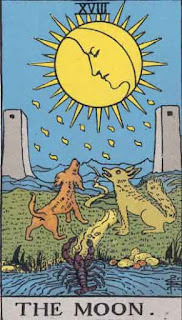 I chose the Moon from the Rider-Waite deck because of some recurring images from the previous Death card. In the background of the Death card, we see these same two strange looking towers- and the sun, perhaps rising, perhaps setting, between them. Between these two towers we see a path running along, and the Moon shining over it, illuminating the way despite the dark night. 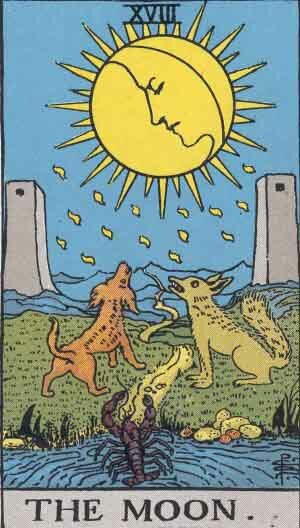 The two figures in the foreground are a dog and a wolf- closely related, except one is domesticated, the other is not. They represent two halves of our own mental makeup- one controlled, the other wild. The meaning here is that through the darkest night, through all of our confusion and uncertainty, the path through it is there. There's a way to see where we're supposed to go- those signposts the Star gave us may not always be there- we may go further down the road and leave them behind, but wherever we go, we carry that knowledge with us, and can remember it in times of need, when things seem strange and frightening. Now we have, in many ways, the opposite of the Moon, the Sun. Whereas the Moon denotes night, the Sun denotes daytime. Here we see a lot of images of growth and expansion, and happiness. Perhaps a better word would be confidence and certainty. Remember that in the Tarot, figures riding horses indicate mastery and understanding- not just control over, but understanding. 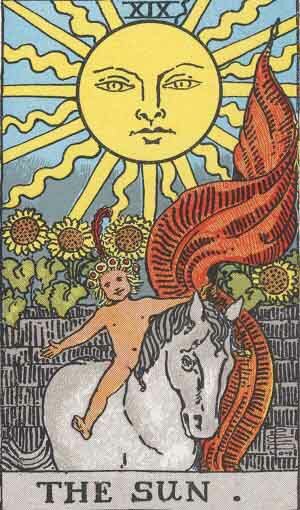 So this kid riding a horse indicates an understanding and knowledge of the world around him, and whereas with the Moon we had uncertainty and illusion, here we find that the Moon has given way to the Sun, and what was hidden and unclear now becomes clear and illuminated. It's also a message of having come through the darkness and troubles of the night, and into the new day. It's also interesting to note that here we have a message of growth and expansion- here are the things previously dormant or hidden during the night, now come to light and ready to grow, for better or for worse- the seeds we plant, this card tells us, will ultimately grow under the sun's power. The sun is impartial, it simply gives energy to the earth, and follows natural laws- it's we ourselves that use those things for good or for evil, and ultimately reap the rewards or troubles from that. Finally, on to Judgement. This card is actually somewhat mis-titled, as the card refers to hearing or understanding a higher calling in life. The image is of the final judgement, when the dead and the living are supposedly judged for the merits and faults accumulated during their lives. While a final judgement is a common theme across historical beliefs, there's another level of meaning here. There are dead people in the foreground, and they are ready to move out on the angel's command, and his trumpet has called them forth. These people, laying in their graves not really doing much of anything, now are ready to take on renewed life and a new beginning, and this is the message here- it's time to realize a higher purpose, and heed the call, that may seem impossible, but nonetheless is there. Here we have a message of moving from where you are to where you could be- there's a higher purpose for us, and this card tells us to follow that higher purpose, wherever it may lead. As the Fool learns more and more, and begins to understand more and more about the world around him, he too finds a higher calling, a call to rise above his roots and find deeper levels of truth. As the Fool has moved through his journey with all its lessons, we find that there's always another level to discover. 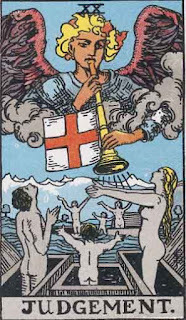 Finally, this brings us up to the World- the last card in the sequence of the Major Arcana. 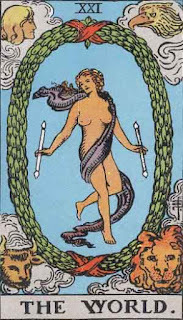 Notice a couple similar symbols to the Magician card- the woman holds wands similar to the Magician's, and as there is a lemniscate (sideways figure-8) above the Magician's head, we have the same symbol here- the red ribbons above and below the woman, on the wreath that surrounds her. 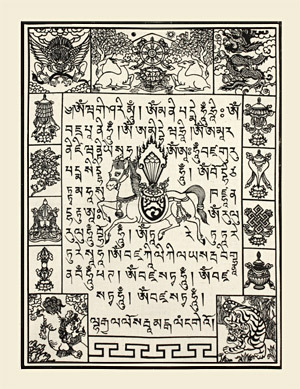 The World symbolizes completion and wholeness- the Fool a fool no more, having absorbed and understood all of the lessons he has learned along his journey. The four faces on the four corners of the card symbolize the four natures of humankind, and represent mankind at its finest. The World is both a card of endings and new beginnings, and we see those here- though the Fool has completed his journey, like we see in the previous Judgement card, that it's not over yet- as the Fool goes along, he still has deeper truths to discover, and will continue to build on the foundation he has already established. So on it goes, much like that unending circle on this card- from one level of knowledge ever upwards, to deeper and deeper understanding.